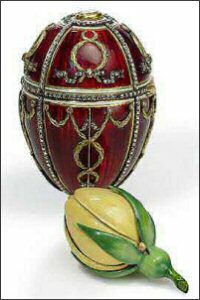 The 1895 Rosebud Egg is made of varicolored gold, translucent red and opaque white enamel, diamonds and cream velvet lining. The Rosebud is made of gold and opaque green and yellow enamel. The missing surprises, inside the rosebud, were a crown, made of gold, with diamonds and rubies, and the missing pendant was a cabochon Ruby. 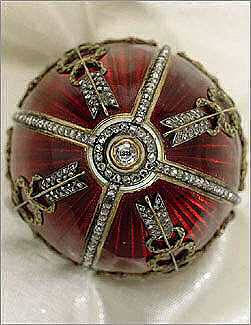 This Louis XVI-style Egg is covered with translucent red enamel on a wave-patterned guilloche field, quartered by lines of rose-cut diamonds and is surmounted by a miniature of Nicholas II beneath a portrait diamond, encircled by rose-cut diamonds. The year, 1894 is set in the base beneath a diamond. The egg opens to reveal a hinged yellow rosebud, another symbol of the couple's love for one another. 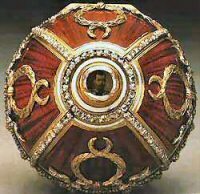 The bud in turn originally contained two tiny surprises, a miniature replica of the Imperial crown, representing Alexandra's new life as the Empress of Russia, and a ruby Egg pendant hanging within it. Like the almost identical crown and pendant of the First Imperial Hen Egg, these two surprises were separated from the Egg before it was sold by the Soviet government in the 1920s; their present whereabouts are unknown. Alexander III died rather unexpectedly on 20 October 1894. 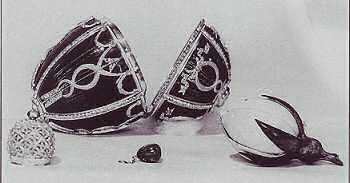 Tsar Nicholas II came to the throne and an Easter Egg had to be made urgently for the new Empress, Alexandra Feodorovna, whom he had married on 14 November, just a few weeks after the death of his father. Nevertheless, the Egg seems to signal the ill-fated events that would befall the Romanov's. 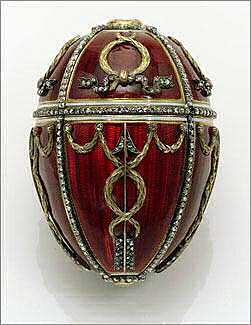 Meant as a token of new love, the Egg would in times to come, no doubt remind the Tsarina of her son's hemophilia. And the choice of yellow for the rosebud is curious. in the nineteenth century yellow roses usually signified the end of a romantic relationship, if given by a man to a woman. 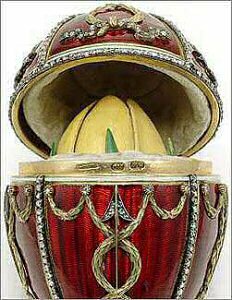 In Germany, Alexandra Feodorovna's native country, on the other hand, yellow was regarded as the noblest and worthiest color for a rose, and Fabergé therefore considered it to be an appropriate surprise within this Egg for her. Ca. 1927 the Rosebud Egg was one of the nine Imperial Eggs sold by the Antikvariat Moscow, to Emanuel Snowman of Wartski, london. 1935 Owned by Charles Parsons, London. Sold to Henry Talbot de Vere Clifton, millionaire landowner, sportsman and poet, UK. 1962 - 1985 whereabouts unknown. 1985 private sale to the Forbes Magazine Collection, New York. 2004 private sale by Forbes family to the Vekselberg Foundation/The Link of Times Foundation, Russia. After 80 years of exile the Rosebud Egg and 8 other Imperial Eggs have returned home thanks to Russian businessman Victor Vekselberg, who has purchased them from Malcolm Forbes' heirs. Sale of the Forbes' collection through Sotheby's auction in the beginning of 2004 could make objects channel off in separate collections and countries. Purchasing of the whole collection by Mr. Vekselberg, before the advertised bidding, is unprecedented in auction practice! An old photograph from the Fabergé archives shows the Egg with the three surprises.